Why Does ACE Sponsor Fitness-related Research Studies? This study was sponsored by the American Council on Exercise. For more than 20 years, ACE has commissioned independent research studies from major universities and trusted partners across the country, covering everything from infomercial fitness products to the effectiveness of some of the hottest trends in health and fitness. ACE is committed to investing in these studies as part of its mission to promote the benefits of physical activity and to protect people from unsafe and ineffective fitness products and trends. 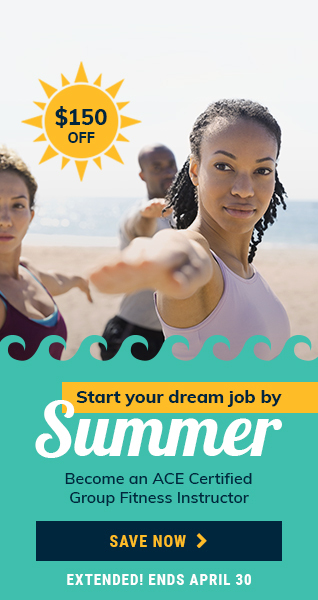 You can find more information about past ACE-sponsored studies, including research on the best abdominal exercises, kettlebell workouts and Zumba, by clicking here. TRX Suspension Training, which leverages gravity and the exerciser’s body weight to enable the performance of hundreds of exercises, is undoubtedly a favorite among health and fitness professionals. Over the past decade or so, the TRX Suspension Trainer has become a mainstay in gyms and training studios around the world. The company’s website (www.trxtraining.com) reports numerous benefits, including the ability to get a fast, effective total-body workout, improve mobility and flexibility, build lean muscle and develop core stability and functional strength. Seeing a lack of research investigating the physiological responses to Suspension Training, ACE enlisted the help of Lance C. Dalleck, Ph.D., and his team of researchers in the Recreation, Exercise, and Sport Science Department at Western State Colorado University. 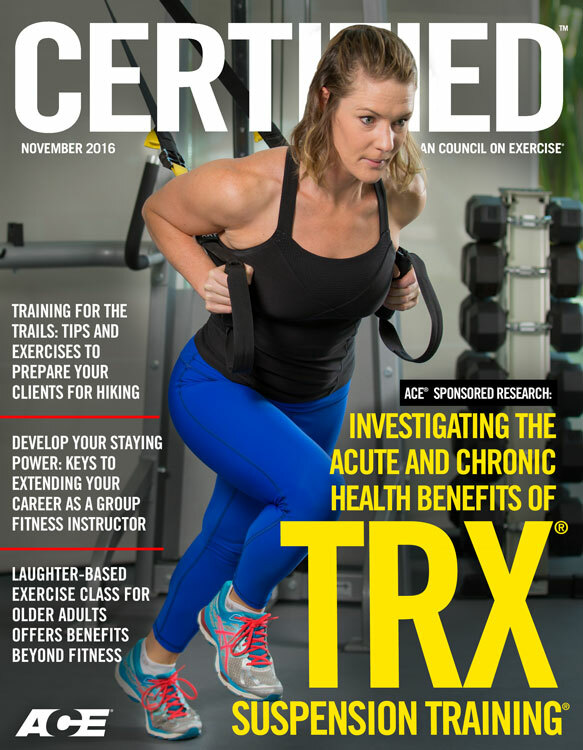 According to the researcher team, understanding the acute cardiovascular and metabolic responses to TRX Suspension Training is essential for designing safe and effective programs on this highly versatile piece of equipment. In addition, a better understanding of the health benefits obtained through consistent, long-term participation would be helpful for researchers, trainers and participants alike. The purpose of this study was twofold. First, the researchers set out to quantify the acute cardiovascular and metabolic responses to a single session of TRX Suspension Training. Second, they wanted to determine the effectiveness of an eight-week TRX Suspension Training program at improving cardiorespiratory, muscular, neuromotor and flexibility fitness, as well as in positively modifying cardiometabolic risk factors. The research team recruited 16 healthy men and women (21 to 71 years of age) to participate in the study (Table 1). All participants were considered low-to-moderate risk and were physically active. To quantify the acute cardiovascular and metabolic responses to a single Suspension Training session, participants wore a portable calorimetric measurement system and a heart-rate monitor. For this element of the research, participants performed a 60-minute class, which began with a five-minute warm-up consisting of dynamic stretching and ended with a five-minute cool-down consisting of upper- and lower-extremity static stretching. Before and after this eight-week program, participants completed a graded exercise test on a treadmill to determine maximal heart rate (HRmax) and maximal oxygen uptake (VO2max). Various other measures were recorded at baseline and post-program, including resting blood pressure, body composition, fasting blood lipids and blood glucose, and waist circumference, to determine if the TRX Suspension Training program was effective at positively modifying cardiometabolic risk factors. In addition to these cardiometabolic values, the research team wanted to be able to evaluate the muscular, neuromotor and flexibility fitness of the participants before and after the program. To measure muscular strength, they had the participants complete one-repetition maximum (1-RM) testing on the bench press and leg press exercises. Flexibility was assessed using a modified sit-and-reach test, while muscular endurance was evaluated using push-up and curl-up tests. Balance was assessed using the single-leg stance with the eyes closed. The program itself consisted of three 60-minute sessions per week, for a total of 24 sessions. Only the data from those participants who completed 18 or more sessions (75 percent of the classes) were included in the final analysis. The individual TRX classes varied considerably over the course of the study, but generally consisted of traditional and functional resistance-training exercises performed on the TRX Suspension Training system. For example, a particular class might include some combination of the following exercises: lunges, push-ups, pull-ups, chest presses, rows, squats, side arm planks with rotation, and curls. For each session, eight stations were used and participants rotated stations every 60 or 90 seconds, depending on the class design. Participants would then rotate off the TRX stations to perform a couple of cardiorespiratory exercise stations, such as agility ladder drills or kettlebell swings. After a water break, the class returned to the TRX Suspension Training stations to begin a new series of exercises. The acute responses to the 60-minute session are presented in Table 2, while Figure 2 illustrates the exercise intensity for a representative participant. 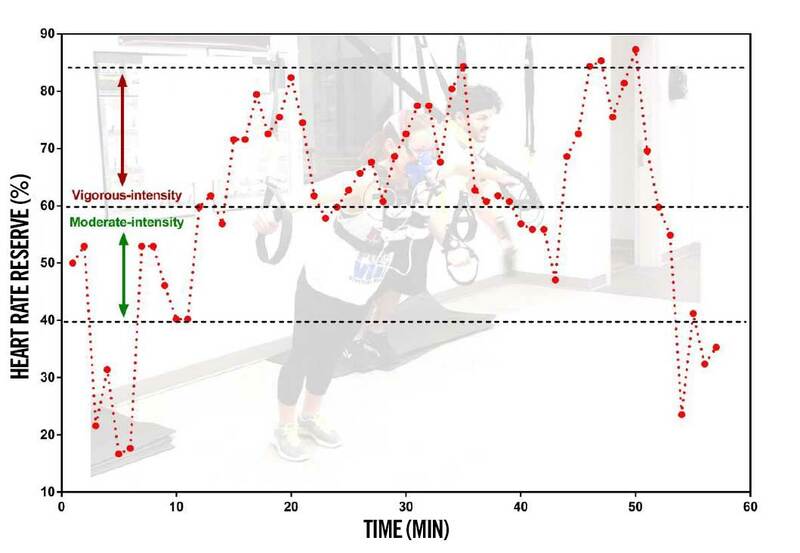 Figure 1 – Exercise intensity in terms of heart-rate reserve (HRR) for a representative participant throughout the duration of the TRX Suspension Training class. As you can see, the majority of class time featured vigorous-intensity exercise and the participants burned an average of nearly 400 calories during the session, which is at the upper reaches of the 150 to 400 calories that define the energy expenditure goal set forth by the American College of Sports Medicine (ACSM, 2014). The metabolic equivalent (MET) value for the class was 5.81, which is again at the upper end of the 3 to 6 MET range that defines moderate-intensity exercise (ACSM, 2014). The chronic cardiovascular and metabolic responses to the eight-week TRX Suspension Training program are presented in Table 3. Combined, these improvements indicate a positive effect on body composition and cardiovascular health. The reduction in resting blood pressure also stood out, as this was evident in even those participants who were normotensive (i.e., those who had a normal blood pressure prior to the start of the study). Those who were prehypertensive (none of the participants had hypertension) saw more of a benefit than those with normal blood pressures, in some cases a 10 to 12 point drop. “These are more dramatic results than are typically seen with traditional aerobic exercise,” Dr. Dalleck points out. There is one more aspect of the results worth highlighting. 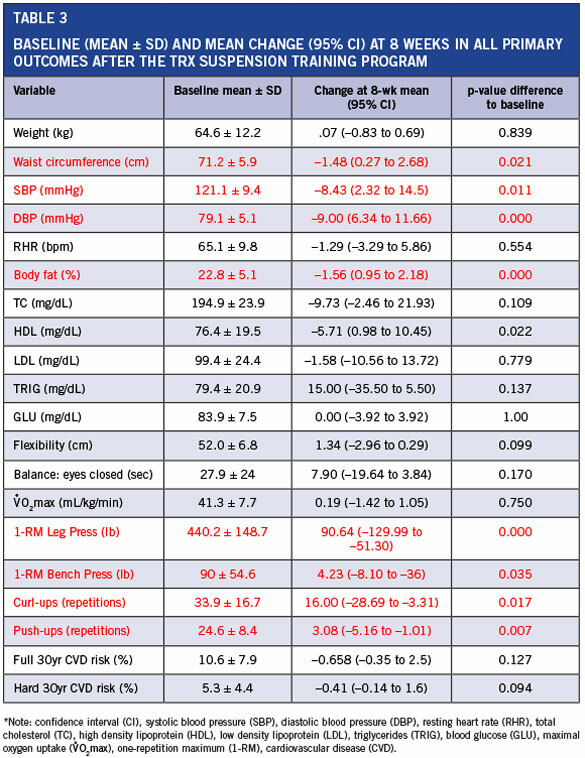 There was not a substantial improvement seen in the participants’ VO2max, a commonly used measure of cardiovascular health, though this may be due to the fact that the participants in this study were pretty fit at baseline. Your less-fit clients or participants would likely see a more dramatic improvement in VO2max than was experienced by these study subjects. TRX Suspension Training is a good alternative to traditional exercise modalities. It elicits metabolic responses that meet guidelines for improving and maintaining cardiorespiratory fitness, improves muscular fitness and positively impacts cardiovascular disease risk factors. Dr. Dalleck points out that TRX Suspension Training was holistically beneficial, as demonstrated by the improvements seen in cardiovascular and muscular fitness over only eight weeks. Combine that with the likely benefits to a person’s flexibility and balance over the long-term and you see that this type of training program can have a tremendous impact on an individual’s overall health. Finally, to provide more clinical application of their results, the research team performed magnitude-based inferences (that is, the real-world relevance of the data). They found that TRX Suspension Training is 89.2 percent clinically beneficial in improving “hard 30-year cardiovascular disease risk” (these are mortality events) and 86 percent clinically beneficial in improving “full 30-year cardiovascular disease risk” (this includes myocardial infarction and other less severe events). While the statistics involved with generating these numbers is rather complex, the take-away point here is that long-term adherence to TRX Suspension Training is likely to decrease the likelihood of your client or participant suffering a cardiovascular event. Combine that with the many other benefits demonstrated through this research and you’ll have plenty of reasons to encourage your clients or participants to add TRX Suspension Training to their workout routines. 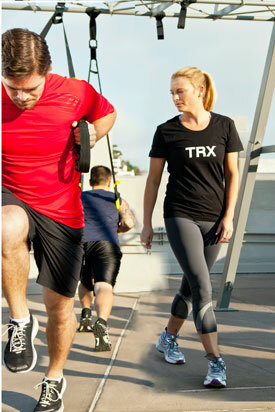 TRX® and Suspension Training® are registered trademarks of Fitness Anywhere, LLC and are used with permission. ACE® is registered trademark of American Council on Exercise. To quantify the acute cardiovascular and metabolic responses to a single Suspension Training session, participants wore a _______________________________. Participants burned an average of nearly ________ calories during the TRX Suspension Training session. Which of the following is NOT one of the areas in which participants showed significant decreases following participation in the TRX Suspension Training program? Participants who were prehypertensive experienced as much as a _______ point drop in blood pressure after participating in the program.